Colorful Flowers on Adenium "Arabicum"
Fancy Rosy Adenium grafting on Adenium Arabicum rootstock, 14 inches caudex diameter, aged 3 years, grows in Bonsai Pot. for easier selling. Bonsai's trend on Adenium seedling came here 5 years ago but most players focused on growing Arabicum or Thai Socotranum. Most nursery here grow on Adenium Obesum or Adenium Arabicum seperately because nursery’ owners are afraid of they will mess up crossing together and the important thing is that Obesum (colorful flowers) is easier to sell to market. Arabicum and Thai Socotranum are mostly sell to a group of bonsai players or collectors. 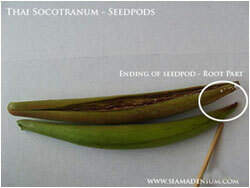 That’s why obesum growers or gardeners here use Obesum as rootstocks. They also believed that grafting on same scions from mother plant and rootstocks will give flower’s stability and productive flower like mother plant when grafting on obesum rootstock. 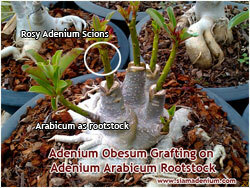 Can we graft Obesum on Arabicum even they are different species? Grafting Rosy Adenium (obesum) on Arabicum as rootstock, you can see flowers are very productive like grafting on Obesum as rootstock. nice colorful flowers. Luckily, Arabicum branches can link very well and faster with Rosy Adenium or Multi-overlapping petals from Obesum than other obesum single flowers. From my experiences, I have found that it takes about 10 days for grafting. You can notice or check scions and branches completely link together from seeing new small leaves coming out from top of scions or having new incoming buds. I always cut or remove leaves from scions because this will reduce dehydration on scion’ leaves and make scions can absorb more food from rootstock in order scions not to be wrinkle or die before grafting. Another new grafting style is called "Fancy Grafting". It means grafting many flower varieties or multi-colors on the same rootstock. Fancy or Multi-Colors Grafting on Arabicum Rootstock. 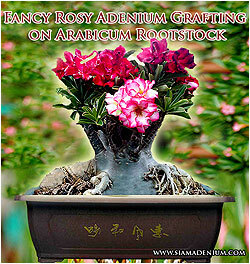 Rosy Adenium Scions grafting with Araicum rootstock. scion for a week. This will make scions and rootstock branches feel very hungry and make them connect faster. We have 3 kinds of rootstock (Round shaped Obesum, Root show or Thai Rootstock, and Arabicum bonsai rootstocks for your selections. 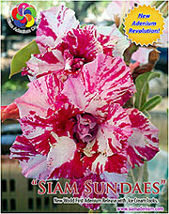 We also provide you with many adenium flowers to graft with them both of Rosy Adenium and single adenium flowers. 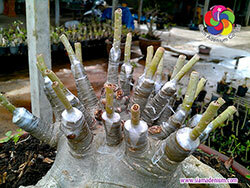 You can select what adenium flowers you like and rootstock types then we will make grafting for you. 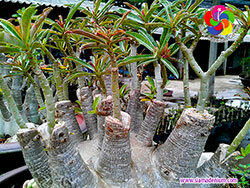 You can see more information on our medium and large adenium caudex from this link. That's all for today and enjoy adenium growing. Take care and have a nice day.